One of the rumblings that will arise out of the Calder Cup Championship won by the Lake Erie Monsters is the lasting impact it will have on the Blue Jackets Defensive Corps. While the goal tenders played well down the stretch, the Defense played just as well, blocking shots, sweeping away rebounds, skating the puck out of trouble. They deserve a lot of credit as well. Yet that performance raises interesting questions moving forward into the 2016-17 season for the Columubus Blue Jackets. First and foremost is the hiring of Brad Shaw as Associate Coach to replace Craig Hartsburg. Shaw will run the defense, and it is widely reported that the lure of blue chip prospects like Seth Jones, Ryan Murray, and Zach Werenski are a big part of why he came to Columbus. But, Werenski did not win the Calder Cup single handedly, and the Blue Jackets have a full roster of 1 way contract defensemen already signed. So let's ponder this a bit. But there are other D-men at Lake Erie who are going to get a long look in camp. Dillon Heatherington looked like he came of age in the playoffs, and was a stout force in the championship game. He is more of a defensive D-man, and skating the puck out of danger won't be his forte. However, in the NHL you still have to be able to turn away the other team when they are pressuring you, and Heatherington has the goods to be able to do that at the NHL level. Dean Kukan played well in the playoffs, and down the stretch, and John Tortorella was sufficiently enamored of his quick skating and soft hands as to give him a long look in the NHL down the stretch. He looks to have a future in today's fast moving NHL. That leaves Michael Paliotta and Justin Falk as tweeners, battling for that last spot at the NHL, as well as the injured John Rammage, who is probably looking at another year in the AHL. The Lake Erie Corps was rounded out with Jamie Sifers and Steve Emminger, veteran AHL D-men who were critical to Lake Erie's success, and probably will see financial rewards for the championship (depending on their contract status) rather than a spot in the NHL. One of my favorites, Oleg Yevenko will return to the AHL after finishing the year on loan to his national team. Kevin Connauton and Andrew Bodnarchuk were lost to waivers during the 2015-16 season. On the Blue Jackets end of things it is every bit as crowded. On one-way contracts are Ryan Murray, Seth Jones, David Savard, Jack Johnson, Fedor Tyutin, Dalton Prout and Cody Goloubef . That's seven defensemen for six playing positions, with Werenski knocking hard on the door. So something has to give at the NHL level. So, since it's Father's Day, I am going to gift myself something in the way of a trade. I am going to trade Jack Johnson, Cody Goloubef , Dalton Prout, and the 34th overall pick to Edmonton for Ryan Nugent-Hopkins. Happy Father's Day to me!!! RNH gives us the centerman we need, and we clear some of the log jam on the blue line. Edmonton gets to augment their defense, which they sorely need. 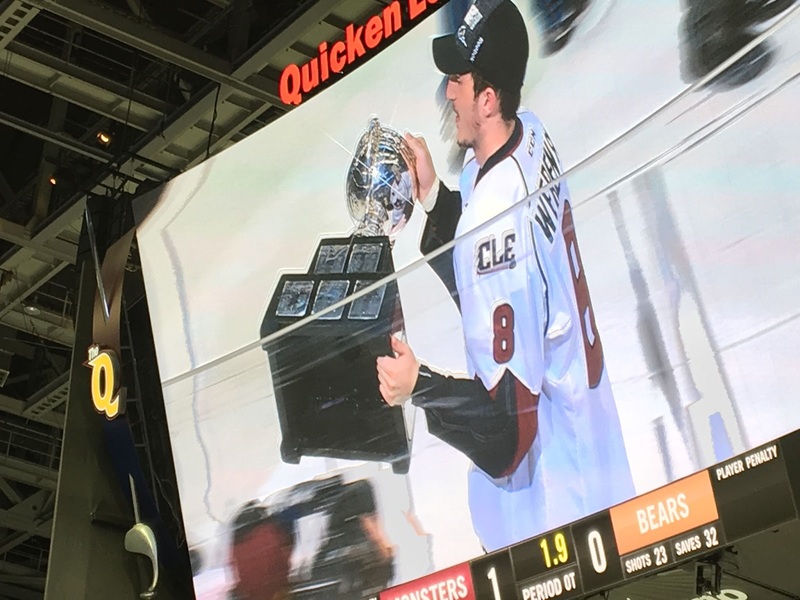 The Lake Erie Monsters Calder Cup Championship has created a lot of possibilities. It will be interesting to see how this plays out.